Where do you find the best burger in Laguna Beach? Where’s the best place to dial in live jazz? Where do Laguna residents go to hike, enjoy the best Taco Tuesday, order signature cocktails at happy hour prices, or nab the quintessential graduation gift or boxed holiday gift cards? • Activities locals participate in as we live our daily lives here. Still committed to providing a completely unbiased opinion, Laguna Beach resident Diane Armitage is never paid to write about specific restaurants, retailers or events. 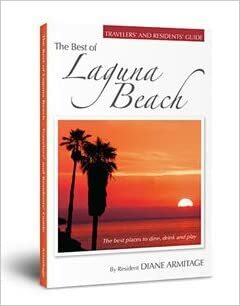 The Best of Laguna Beach provides an honest, objective and conversationally fun review of what residents truly consider the best. Just $22.95, this travel guide for Laguna Beach is great reading and information for tourists and residents alike, with more than 200 recommendations, fun facts and tips as well as directories for free trolleys, hotel accommodations, dog-friendly restaurants and more.